WordPress 2.5 was released about a week ago, and it looked absolutely delicious to me. Seriously, I salivated. I was using Movable Type at the time, but it was extremely old (Perhaps four or five years old! Software! Web software!) because I had neglected to upgrade it. I should also point out that, having worked for years in a group whose sole purpose was to facilitate the updating of software, this is the height of irony. And yet I trudged along with MT 2.64 (or whatever) for years. May I tell you what I’m getting out of this upgrade? Please? That would make me happy. Note that these aren’t necessarily new things in WordPress 2.5, they’re just new to me in terms of blogging software. These are mostly older ideas. Blogging via email. I did this post almost entirely from an email message! It’s like the blog software just disappears and I’m just writing email. That means I’ll probably post more frequently, and it’s more likely I’ll do so while I’m on the road or away from a regular computer. I can do email on the iPhone just fine, but I don’t want to write 500 words in a textarea in Safari Touch. Akismet spam blocking. Anyone who followed my old comments feed knows that while I often crowed about blocking so many thousand comment spams, quite a few still got through every day. For every fifty I would block, five or ten would sneak through and hang out for half an hour before I noticed and removed them. Still, I’m not one of those people who wants to moderate every comment and only show comments I approve. This is the Internet. It’s supposed to be a little Wild West. That’s a strength, not a weakness. I want you all to be able to have a little comment party with each other when I’m not around. I can’t do that if I’m playing monitor. I’m hoping the algorithmic brain in Akismet will work its magic so I won’t have to, and we can all feel satisfied knowing our comments are published immediately. Friendlier archive URLs. When my tracking software tells me someone went to /archives/001545.php, what does that tell me? Nothing. That’s what. And that URL doesn’t tell you anything either. But if I see someone visited /2008/03/26/bus-etiquette/, I know exactly what that is. And so do you. It’s nice. The rotating tag line is back. See, up there at the top? Yeah. Don’t get too attached: it could disappear just as easily. Just enjoy it for a little while. Also, it doesn’t change every time you reload the page. It’s something like every 5 minutes. So don’t drive yourself nuts. Just read early and read often. No more “rebuilding.” Movable Type 2.whatever always made me rebuild my blog. Perhaps because it was created before the widespread dissemination of PHP and MySQL on small-time hosts? I don’t know. Either way, rebuilding is a dead concept. Yay! A huge plugin repository. If I want to augment the functionality of my blog in any way, it’s likely someone else has already written it, and it’s up there now. Sometimes the quality isn’t what you’d want, but it’s all open source, so I can geek out on the code and fix it if that’s needed. 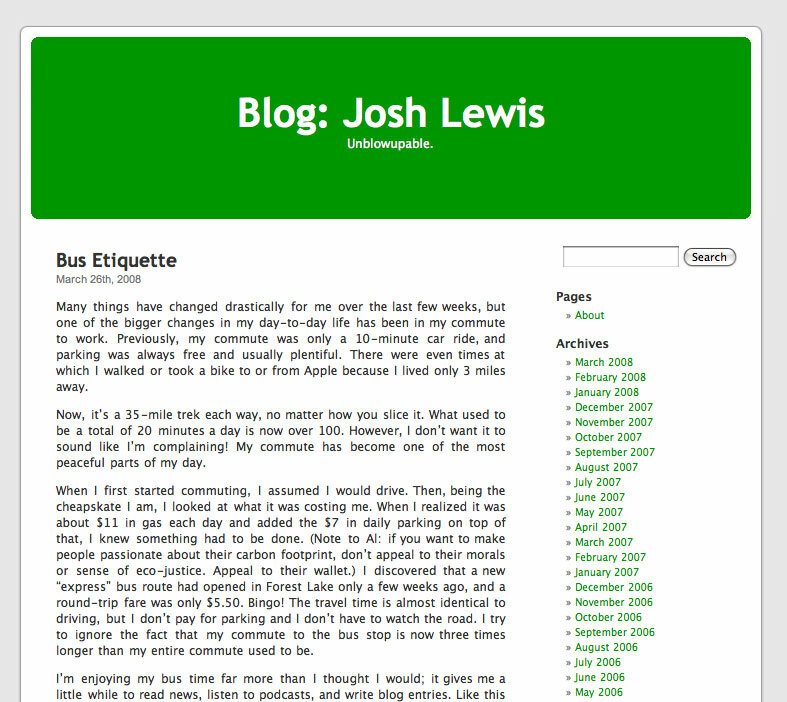 The design you’re seeing on this blog (shown here for posterity) is temporary. It’s really just a half-hearted attempt to get things looking somewhat normal (without looking identical to the default, that is) before I have time to redesign the thing. Hang in there. I don’t like the way it looks now, but I’ll be making tweaks over the coming weeks, and steering it towards where I want it to be. I’ll keep the archives and search functionality this time.